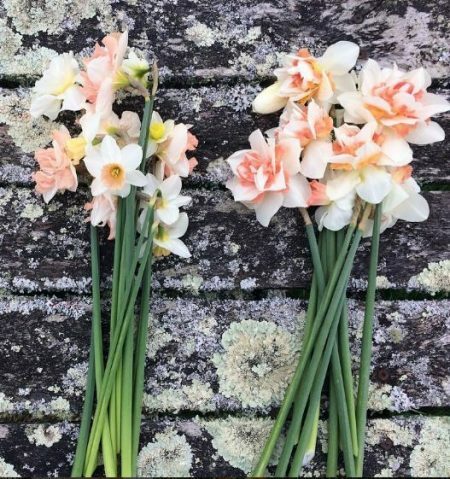 Daffodils – the birth flower of March – are trumpet-shaped flowers that come in a variety of sizes and colours. Traditionally, they are a sunny yellow but can also be white or pastel yellow. Across many cultures, the daffodil has an uplifting meaning. Typically they symbolize creativity, inspiration, renewal, inner reflection and forgiveness. In Chinese culture the daffodil symbolizes good fortune, while in Japan it means joyousness. French people see the daffodil as a symbol of hope and in Wales the first to find a daffodil bloom will be blessed for the upcoming year. The daffodil flower is a trumpet shaped bloom on a slender stalk. The unique flowers can range from ½ an inch to 5 inches depending on the plant size. Native to the Mediterranean, they originally grew in Greece and Rome before becoming wild, and then being cultivated by Europe.